Caricatures of three kabuki actors playing a hand game, similar to "rock, paper, scissor." The writing at top names the animals in light verse and was to accompany the game. The actors were Nakamura Utaemon IV (1798-1852), Kinshō, and Ichikawa Kyūzō, who originally popularized the game of ken in the play Kurabe utate miwa no Aizuchi, played at the Kawarazaki Theater in Edo starting in the first month of 1847. Sake must be ken-zake, but there are different kinds. The frog jumps once, jumps thrice. Let us take the slug! Ding-dong, ding-dong, ding-dong – stone ken! Watōnai was scolded by his old mother. The tiger crawls forward to the sound of the shamisen. Come along with the fox! 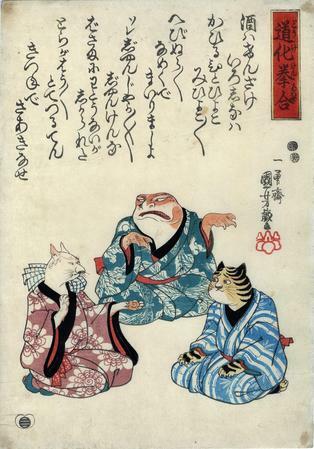 "A fox, a tiger and a frog, dressed in kimonos, play kitsune-ken, each adopting a specific hand posture typical of kitsune-ken: The frog plays the fox, the fox plays the hunter and the tiger plays the village elder. The picture refers to the interlude Warau kado niwaka no shichifuku 笑門俄七福 (sevenfold luck with the dance at the gate of laughter), which was performed in the 4th year of Kōka (1847) in the course of the New Year's kabuki performance at the Kawarasaki theater and led to a big ken boom in Edo. The term derives from the song Sake wa kenzake 酒ハ拳酒, which accompanies the various ken games. It contains the onomatopoetic line totetsuruten トテツルテン, which imitates the sound of the accompanying instrument shamisen. Instead of its original title Warau kado niwaka no shichifuku, the dance piece was given the simple name totetsuru-ken. The Fujiokaya Nikki contains an entry next to this print by Kuniyoshi which describes the immense popularity of the totetsuru-ken. This print portrays the three actors, who performed the totetsuru-ken on stage, as animals. The zoomorphic representation of actors was a popular caricature technique used by Kuniyoshi in order to mask picture topics which were forbidden since the Tenpō reforms. Each one of the three animals represents a popular actor, who can be easily discerned by their distinct facial features. Nakamura Utaemon IV as the frog with thick lips represents the mushi-ken (frog, snake, snail), Matsumoto Kōshirō VI 六代目松本幸四郎 as the pointy-nosed fox represents the kitsune-ken (fox, hunter, village elder) and Ichikawa Kuzō II as the tiger with big eyes represents the tora-ken (tiger, hero Watōnai 和藤内...)"